I think the obvious joke here is a popcorn bucket with a hole in it, but I’m too high brow to go there. This is technically our third watching of Cigarette Burns. The second viewing was a lost episode that never aired, and since we have no intention of watching this 4 times, we went ahead and counted it for the purposes of our experiment. Lets recap! Dawson directed (but didn’t write) a movie! Oliver, the writer, schedules a screening without telling the D man, and all his friends, plus the local hotshot film critic are invited. 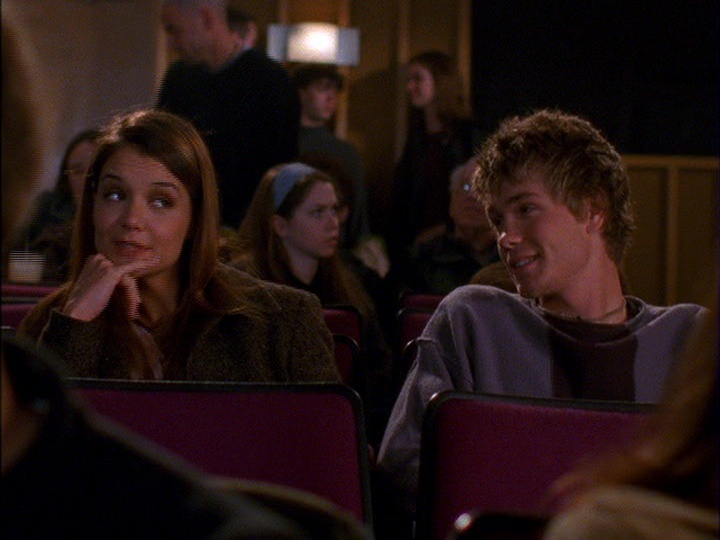 Dawson has a meet-cute with the film critic where he insults her, and hilarity ensues. Meanwhile Joey is crushing on Charlie who is doing his best to be a huge douchebag. Audrey and Pacey are having issues as they discuss their past romantic entanglements. And Jen is dealing with the fact that Grams has a new man in her life: Clifton Mothereffin Smalls. It’s a fun episode, and this is the last time it will ever be on this podcast. Enjoy!